Of all the UFO witnesses, perhaps the astronauts are the most intriguing. Experienced pilots, trained observers, selected partly on the basis of their psychological stability, their word should count for something. And if, as many believe, part of the motive for the extra-terrestrial presence on Earth is to monitor our own technological progress, what would be more likely to incite their interest than our own first ventures into space? 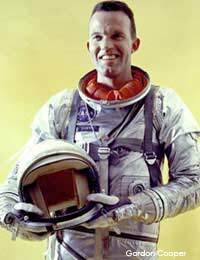 Gordon Cooper was one of the astronauts aboard America’s first manned mission in space. In later years, he became known for his frank views on the UFO subject. Cooper said he had seen UFOs several times in the course of his life. None of these sightings occurred during his spaceflights, it should be pointed out; all took place during his earlier career as a military pilot. Cooper mentioned seeing a flight of metallic discs flying over a US Air Force base in Germany. He even claimed to have filmed a UFO landing in 1957, this time at Edwards Air Force base in the United States. Cooper and a camera crew had been tasked with developing a new landing system at the base. As they shot film, a flying saucer was spotted. Naturally, the camera crew focused on it as it drew closer, extended some landing gear and landed on a dry lake bed nearby. They crept up on it, filming all the while and managed to get to within 20 to 30 feet before it took off again. Cooper reviewed the film and confirmed that it showed everything that had happened. Then he was ordered to send it in a sealed bag to Washington. It was never heard of again. This was not to be Cooper’s only experience with having film he took mysteriously confiscated. When he returned from one of his space missions, he found that some of the images he took from orbit were confiscated too – because he had photographed Area 51! There are many stories of the astronauts sighting UFOs while out in space. Many of the astronaut transmissions, of course, were broadcast publicly. So, along with the stories of sightings, come the stories of public transmissions being cut off because of “technical difficulties” or astronauts employing secret code words to indicate the presence of a UFO. For example, some believe “Santa Claus” was NASA code for a UFO. In one mysterious transmission, an astronaut makes the following strange remark: “Please be informed that there is a Santa Claus”. What did he mean? There are also recordings of transmissions in which the astronauts, indisputably, are talking about something strange. In one mission, Buzz Aldrin, the second man ever to walk on the moon, asks how far the fuel module, which had been ejected from their vehicle some time before, now is from them. The answer came back “6,000 miles”. The astronauts had seen some weird object close to them in space. They wondered whether it might be the fuel module but, at 6,000 miles distant, that clearly couldn’t have been so. Worried that they might be ordered to return because of public fears about aliens, they decided to keep their mouths shut until they were back on Earth. Buzz Aldrin acknowledged all of this candidly in the documentary “Apollo 11: the Untold Story”. Edgar Mitchell is another of those who walked on the moon who later went public with his belief that we were being visited by extra-terrestrials. Although he had never seen a UFO himself, he claimed to have spoken to many high-ranking, respected people within the military who had. Condon Report – A “Bogey” in Space? A strikingly large number of former astronauts have gone public with their belief in UFOs. What really happened out there in space? Perhaps one day the full story will be revealed.